Identified of two different problems: construction debris in the lines and dead-end piping. 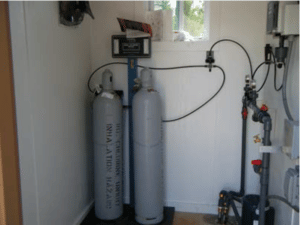 Managed construction of a chlorine booster pump station in Spalding County resulting in a significant savings over a pre-packaged chlorination station. The chlorine residual increased to the area and complaints were reduced. Chlorine was flow paced using an analyzer on the 16-inch line before and after chlorine injections.